Easter is this weekend which means there will be ham. I love ham. It's so good and juicy and sweet and it's just the perfect meat. Really, what's not to love about it? Now, it may seem like this is becoming a post about ham, but I promise it isn't. It's about one of the best accompaniments to ham: sweet potatoes. They are the perfect Thanksgiving side dish but also work so well on those other special, little holidays...like Easter. Alright, be honest...when you read 'sweet potatoes,' how many of you thought about the oven baked chunks that are drenched in butter and sugar and topped with marshmallows? Sure, they're okay, but I find the sweetness to be extremely overpowering. I loved them when I was a kid, but I guess I'm just over all the mini marshmallows. Although I still love sweet potatoes, but now enjoy them in a more pure form. You know, one that isn't masked by a bunch of other flavors. 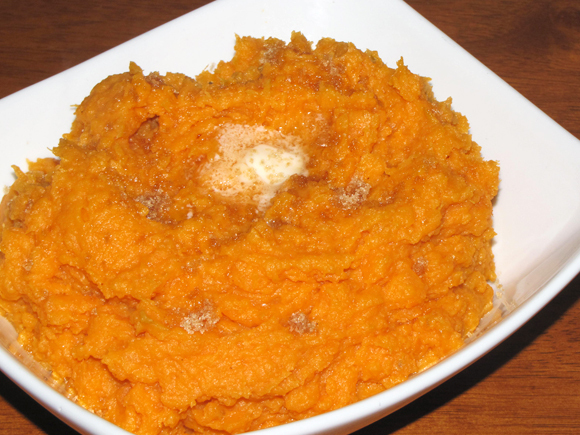 I've made a lot of different things with sweet potatoes over the years to find new and interesting ways to serve them, but I just discovered the awesomeness that is mashed sweet potatoes. I thought about trying them many times, but I honestly just never got around to it. There is such a freshness to this side dish and I bet everyone will love this new take on the classic. It's pure, it's simple, and it's just so good. 2. 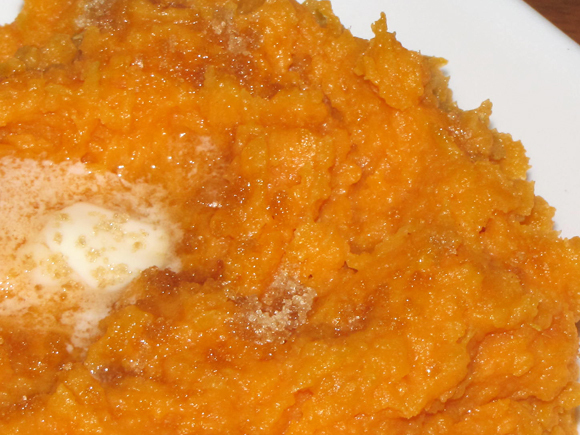 When water starts boiling, add sweet potatoes. Bring back to a boil. 3. Boil for 3-4 minutes or until potatoes are tender. 3. Drain and return to pan. 4. Add butter and milk. Mash together. 5. Season with cinnamon and salt and mix/mash well. 6. Serve with sprinkled brown sugar on top.